The Asociación Filatélica Salvadoreña (AFISAL) was created in San Salvador, El Salvador on 5 January 1940, by Enrique Patiño, Dr. J. Antonio Pinto Lima and Ciro Rusconi. Sixteen enthusiastic philatelists participated in the first meeting and Mr. Patiño was elected the first President of the philatelic club. The group was named Sociedad Filatélica de El Salvador (SFiES). On 3 May 1975, four collectors of El Salvador - Joe Mandos, Alan Powers, Robert Fisher and Joseph Hahn - met outside Philadelphia and decided to start a society for collectors of this country. A forerunner to this group was named "The El Salvador Collectors Club", which was part of the Jack Knight Collectors Club. 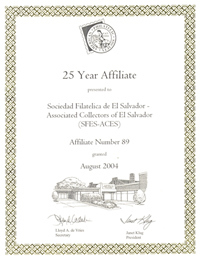 This was changed to Associated Collectors of El Salvador or ACES in 1975. The society grew rather rapidly and within a few years had almost 100 members. 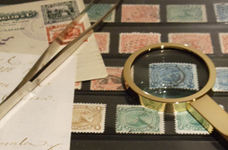 The group conducted mail sales, had a library of philatelic articles on El Salvador and was a key source for members to learn about the stamps and postal history of the country. In 2004, both Societies decided to join their efforts to create a single Philatelic Society devoted to the study of Salvadorian Stamps and Postal History: El Salvador Philatelic Society – ACES. This union produced a revival of the interest in the issues of El Salvador among philatelists around the world. In the same year, the Society received a 25-year affiliate recognition from the Board of Directors of the American Philatelic Society. The Society became a member of FIAF (Federación Interamericana de Filatelia) in 2009. Two years later, due to Salvadorian Law requirements, the Society was reconstituted as a non-profit organization and the name changed to Asociación Filatélica Salvadoreña (AFISAL). The Association is recognized as a non-profit organization under Article 65 of the Salvadorian Law of Non-Profit Associations and Foundations. a. To promote, improve and publicize the study of Philately in general and in particular of El Salvador. b. To strengthen the relations of collectors of El Salvador with members of all other countries. c. To maintain by all possible means the good reputation of the postage stamps of El Salvador.